The following steps will walk you through the process of creating simple DDR3 project with user interface. 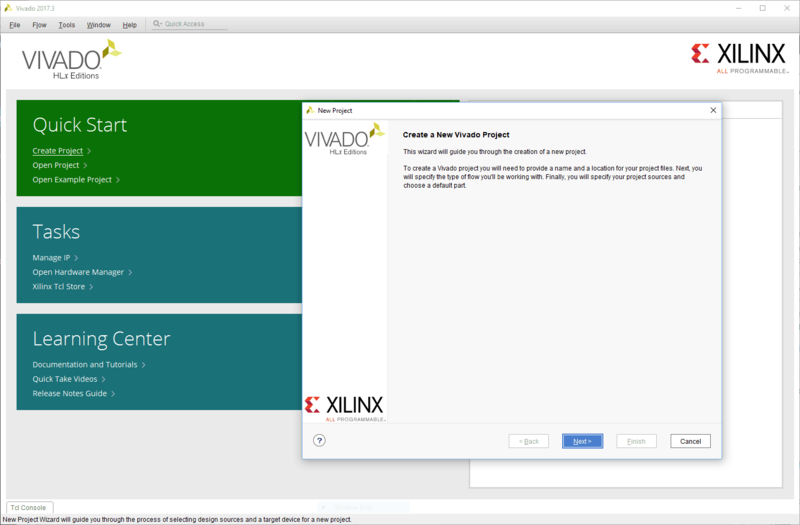 Start Xilinx Vivado Design Suite and select “New Project” from “File” menu. A “New Project” dialog will open. Click “Next” to proceed. 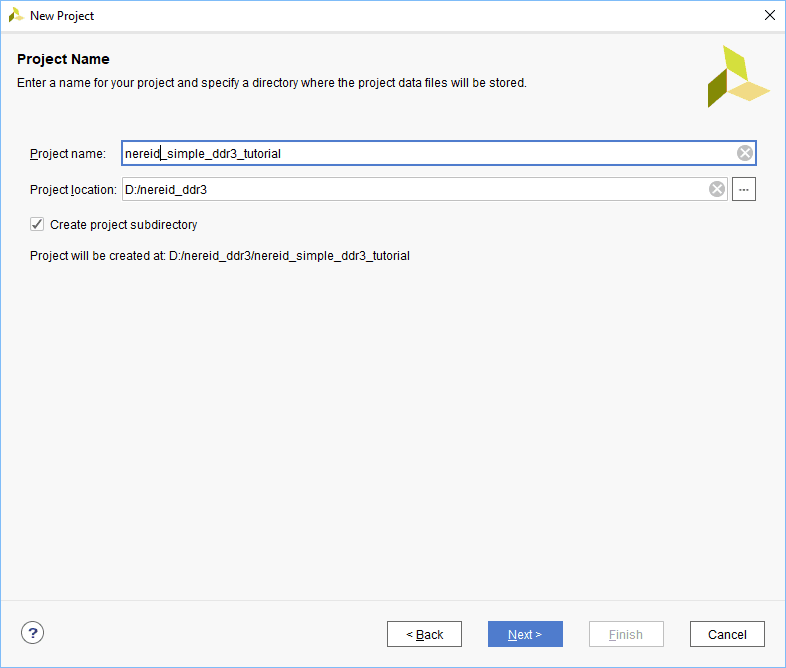 Type in a project name, select a convenient project location and choose “Create project subdirectory” to keep all project files in a single folder. 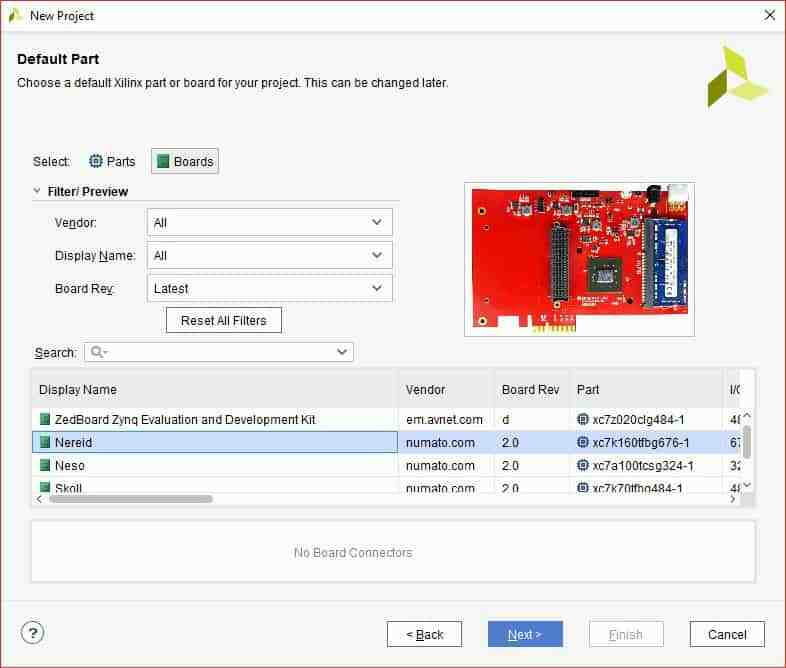 In this article, author has used “nereid-simple-ddr3-tutorial” as a project name. Click “Next”, select “RTL Project” as project type and select “Do not specify sources at this time”. Click “Next” to proceed. Select “Boards” from “Default Part” tab, choose “numato.com” as a Vendor. Select “Nereid” and click “Next”. If Nereid is not listed, make sure board support files are installed correctly. Click “Finish”. A new Vivado project will open with the selected settings. Under the “Flow Navigator”, double click on “IP Catalogue” to add necessary IP cores. 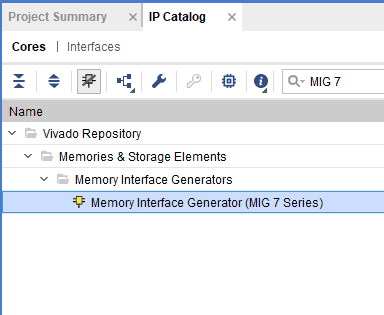 Search for MIG 7 and double click on “Memory Interface Generator (MIG 7 Series)” to customise it. 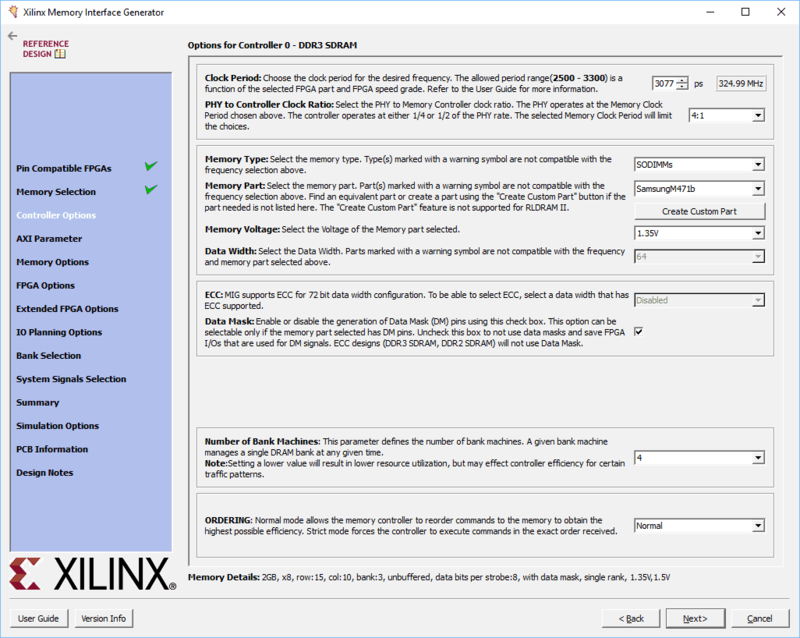 The “Xilinx Memory Interface Generator” configuration window will open. Click “Next”, select component name and de-select “AXI4 Interface”. For this example, “mem” is used as component name. After clicking on “Next” twice, select “DDR3 SDRAM” as Memory. Click “Next”. 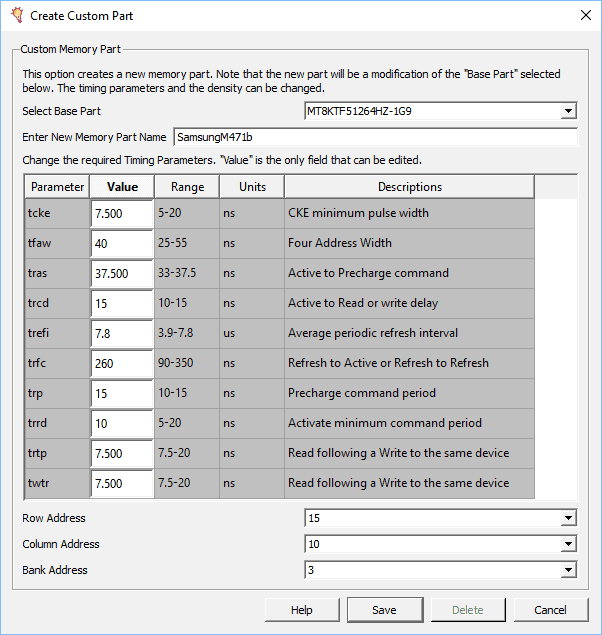 Click “Create Custom Part” to create custom memory. A dialog will open, enter new memory part name, select base part as “MT8KTF51264HZ-1G9” and use the timing parameters shown below. Click “Save”. Select the ‘Controller Options’ as shown below and Click “Next”. Select “Input Clock Period” as “5000 ps (200MHz) “, remaining settings are default. Click “Next” to proceed. Select “FPGA options” as shown below. Click Next, choose “Internal Termination Impedance” as “OFF”. Select “Fixed Pin Out” in the next tab and click “Next”. Assign DDR pins as mentioned in nereid constraint file and validate it by clicking “Validate”. If the pinout is valid click “OK” and “Next” to proceed. Accept the license and click “Next” to proceed. Click “Generate” after clicking “Next” to generate IP core with our customised settings. Search for “Clocking Wizard” IP and double click on it to customise. Choose component name as “clk_wiz”, select “CLK_IN1” board interface to sys_clock and “EXT_RESET_IN” to reset in the “Board” tab. In “Clocking Options” choose primary clock port name as “clk_in”. Choose clk_out1 port name as “clk_200”, requested frequency as “200.000”, de-select locked signal and select “Reset Type” as “Active Low”. Click “OK”. Create a verilog file with .v extension and copy paste the following code in “nereid_ddr3.v” to run simple DDR3 with user interface. 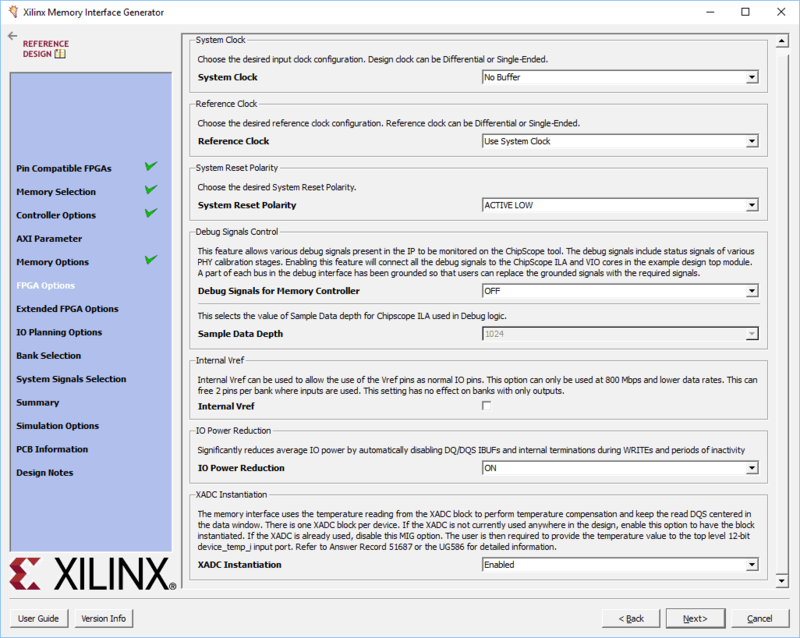 The following code uses the clock wizard IP core and Xilinx MIG 7 IP core along with its own logic for interfacing with the MIG 7 IP core. The clock wizard IP core is used to provide the input clock for MIG 7 which is 200MHz, derived from the 100MHz system clock. The RTL code basically implements a simple FSM with six states to interface with the memory controller. Initially, the FSM is in IDLE state waiting for the memory calibration to complete. When the memory calibration completes successfully, the state machine changes to WRITE state. In WRITE state, the state machine waits for the ready signals from the MIG IP core to accept command and data. Once the app_rdy and app_wdf_rdy signals from the MIG IP go HIGH, the core is ready to accept commands and the data to write to DDR3. The state machine writes data and command to MIG IP core and changes its state to WRITE_DONE. In this state, the command enable (app_en) and data enable (app_wdf_en) are de-asserted by the state machine. Whenever command and data enable signals become LOW, the state proceeds to READ state to read data back from memory. In READ state, state machine waits for the ready signal from MIG IP to accept command. When the app_rdy is asserted from MIG, the command is accepted and the state changes to READ_DONE. In READ_DONE state, the state machine de-asserts the command enable and waits for the app_rd_data_valid to get asserted. Whenever app_rd_data_valid signal gets asserted, the data is read back from memory to data_read_from_memory register and the state changes to PARK. In PARK state, the machine compares the data written to DDR3 with the data read back from DDR3. The RGB LEDs are Active-Low, soled_calib, led_pass and led_fail signals have to be driven low when asserted. If the data match, then led_pass goes LOW otherwise led_fail goes LOW. The memory calibration is inverted and assigned to led_calib. Create a constraint file and copy-paste the following constraints. Generate Bitstream by clicking on “Generate Bitstream”. Once Bitstream generated successfully, power up Nereid and program the device. DDR3 is working properly, Red and Green LEDs both will glow (As a result, combined color will be visible as yellow as shown in image above). DDR3 is not working properly, Blue LED will glow. If RAM Module is not inserted properly, none of the LEDs will glow. If you observe Red and Green LEDs glowing for a while, then your Nereid Kintex 7 DDR3 Example Design worked. Congratulations!